" Glover Sports Shirt - Salesman Sample Ad Card - Circa 1930." 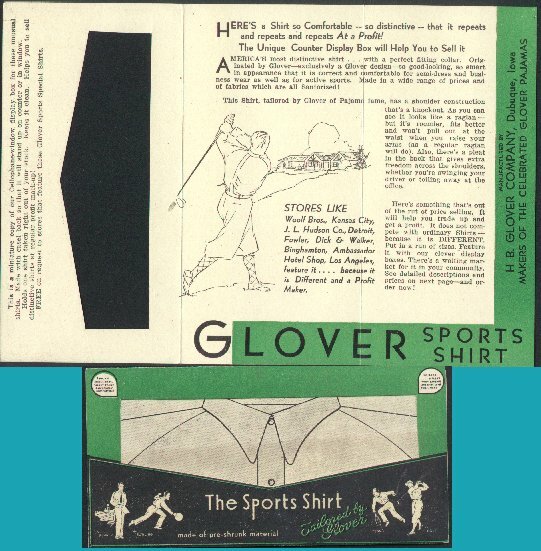 (1180) Glover Sports Shirt - Salesman Sample Ad Card - Circa 1930. Condition: Good Plus Tri Fold Ad card with window showing a sports shirt. This was sent to various stores to demonstrate how a full sized window display box would look. There is an explanation to store owners inside the fold. When opened there is also an illustration of a late 20's or early 30's golfer taking a swing, and a description of the sports shirt. The card measures 9" by 6" when opened. Price: $5.00 + shipping.